I’m a cherry fiend. I admit it. 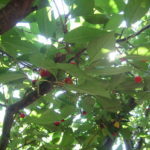 I see the summer coming and know that I’ll spend much of July with a stomachache from eating way too many sweet cherries. 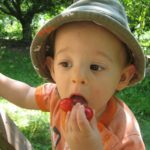 So when I heard about tart cherries growing at Butler’s Orchard in Germantown, Maryland, I couldn’t wait to go pick a few myself. 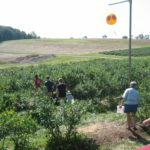 With my kid, Olga and Cecilia in tow, we headed up I-270 to meet Karou at the orchard I often visited as a child. 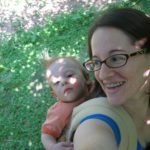 Strapping my own child to my back (hooray for the Ergo carrier! 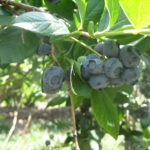 ), we loaded into a tractor destined for the cherry trees and blueberry bushes. 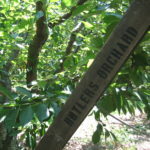 We arrived to find the lower branches were picked clean – and we got there early on the second day of cherry picking! Cecilia managed to snag a ladder early on, and we took turns climbing up to the higher branches for cherries. 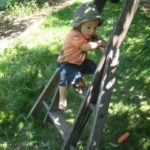 As you can see in the photos, my one-year-old son, Myer, had a blast climbing the lower rungs of the ladder and attempting to eat cherries that had fallen to the ground. Finding the cherries a bit too tart for his palate, he moved on to the blueberry bushes and noshed on a few. Blueberry thief! 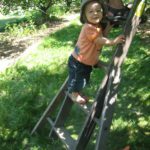 This is a great experience for kids – especially older ones who will remember and can appreciate laboring to pick your own fruit and then turn it into something amazing in the kitchen. A couple of hours and several pounds of cherries and blueberries heavier, we headed south, back to our kitchens to create delicious treats. 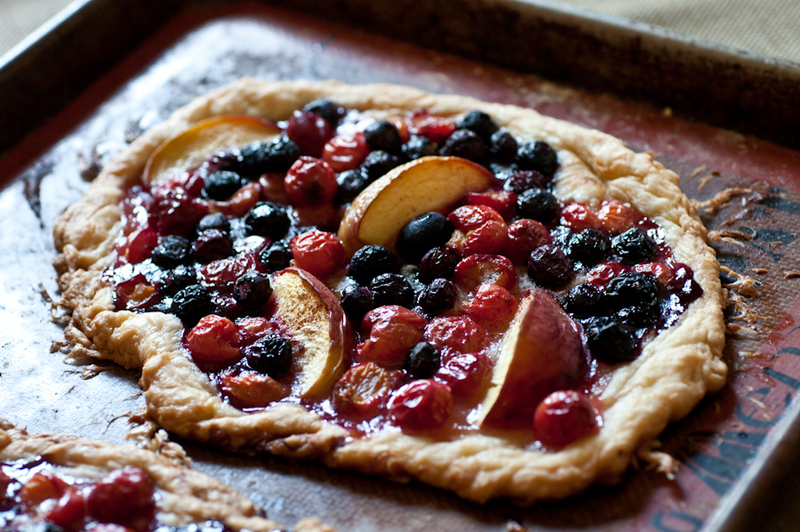 With peaches and blueberries already in my fridge, I decided to make a galette, aka tart. 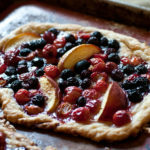 I used Jacques Pepin’s galette recipe as a guide. Since I had two events to attend in one day, I divided the crust into two pieces and brought one to each host. Each tart served 6 adults. 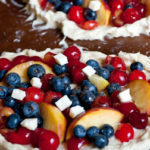 Slice peaches, clean blueberries and distribute them across the dough. 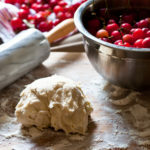 Spread pitted tart cherries on the dough or dust the cherries with sugar to sweeten them a bit before adding to the tart. Drizzle honey on the tarts, sprinkle a little cinnamon, roll up the edges of the dough and add a few bits of cold butter atop the fruit. Bake at 400 for at least 30 minutes until tart is crispy and brown. I love this tart since it’s low in added sugar. That’s the major reason I use Pomona’s Pectin when making jam. With a Mason jar full of pitted cherries, I put the rest into a big pot and followed instructions in the Pomona’s box to make tart cherry jam. I added the zest of one orange to the jam for added flavor. After canning in a water bath for 10 minutes, I removed the jar and heard the telltale POP! indicating the jam is sealed and good on the shelf for up to one year. 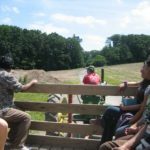 Have you been to a farm to pick your own produce this season? What’s your favorite place to pick your own fruits and veggies? Sour cherries are on of my favorite parts of the summer! This looks heavenly! 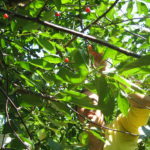 I wish I had come and hand-picked tart cherries in June! 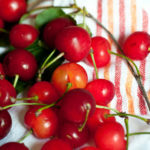 I believe now it is too late…do you have any prepared cherry sauce made with tart cherries? Anna – I didn’t make any cherry sauce, but I canned some sour cherry jam. I’m waiting until at least January to crack it open and enjoy a taste of summer this winter. I’m sure you could mash the cherries in a saucepan, add some water and sugar, and perhaps lemon juice to brighten it up, if needed. Reduce it and pour it over ice cream or something. Yum!